– Free wifi during the day! – $6.00 Lunch – last I heard, Slane is planning on sneaking in an authentic Irish dish somewhere in the Student Special menu. I hear it even before I step in the door: the steady rhythmic beat of the music, people calling out to one another, and the sound of drinks clinking as the bartender, Annie, shakes up another two mojitos. It’s a Tuesday night at Slane on MacDougal, next to the Creperie. If the name Slane is sounding slightly familiar, you might be thinking of the castle it was named after: Slane Castle in Ireland, now a concert hall hosting acts such as the Red Hot Chili Peppers and U2. The cool, slightly quaint Irish aesthetic seemed very much on bar owner Glenda’s mind when she designed the interior: dusted brick walls with niches for candles and green Irish lettering on the walls, and dim pendant lamplights along the bar. The space is cleverly designed to accommodate big groups in the front (they often host birthday parties), football fanatics (there are 5 flat screens, each tuned to a different sport), and a smaller intimate booth in the back (elevated by a step, these few tables offer some privacy if that’s what you’re looking for). Stepping in reminded me of my own trip to Ireland a few years back, and my visit to its oldest pub, the Brazenhead. So just coming in, I knew this wasn’t just an ordinary pub. Sitting at the bar, what caught my eye was their large selection of beers, most notably of them the Irish classics Guinness and Carlsburg, and Sam Adam’s Octoberfest, which had just come into season. Big points to Slane for having a seasonal beer selection, but even more so was the quick and friendly service from Annie, the bartender and only waitress. Even though the bar was filling up fast, she was quick to take my order. The comfort food menu leaned slightly towards European cuisine, ranging from Fish N Chips ($14) to meat and vegetable pies. After much deliberation, my friend and I settled on an appetizer of garlic breaded mushrooms ($8), a chicken & mushroom pie for her ($10), and a classic shepherd’s pie ($13) for me. 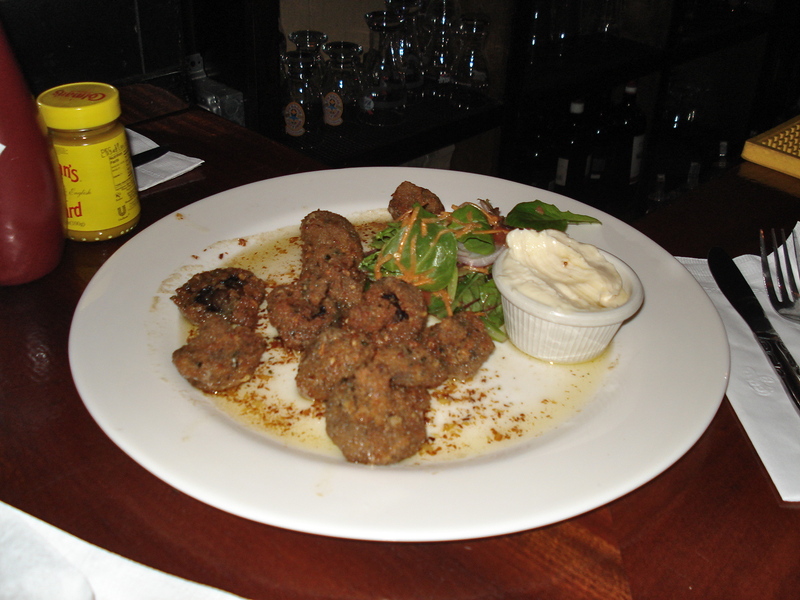 So – the seemingly rudimentary appetizer. Who knew a simple dish of sautéed mushrooms ensconced in bread crumbs, with an underlay of butter and garlic could be so plain delicious? The button mushrooms were just juicy and crispy enough to pop the tastebuds – a hard combination to pull off. Combined with a light side of arugula salad, this dish makes a great vegetarian option. Definitely the high point of the meal, my guest and I devoured the plate in minutes. We didn’t have to wait too long for the entrees to arrive. My shepherd’s pie was a hearty casserole of beef chunks and vegetables, baked with a topping of mashed potatoes. The real winner at the table though, was the meat pie: topped with only a thin crust, the soupy mixture underneath had a nice touch of wine – a sherry like Harvey Bristol, perhaps. Whatever the secret concoction, the flavor soaked into the chicken & mushroom combination, elevating the dish from standard fare to true comfort food (with a slight twist of sophistication to boot). The music was still playing when we finished, but the birthday party had left, making room for the nightly 3 hour music set, Mondays through Thursday. Each night features a different group, playing anything from jazz to a more eclectic alternative pop. Slane is pretty receptive to local bands in the area, and even features student bands from NYU. It’s definitely a good atmosphere whether you’re catching up with the old gang, or whether you want to mingle with new people (I caught a guy’s eye a few times). So, is Slane a tiny slice of Ireland or just a cool joint for hanging out, either before or after hitting up the nightclubs? You decide – Slane is right on MacDougal, close to Bleecker. Click here for a student discount at Slane. Attire: Shorts and Flip-Flop approved. Best For: A bite for lunch, quick evening meal, or late night crave. Danny Meyer has bestowed to NoLIta, the Upper West Side, Miami, and even the Left Bank of France, American burger perfection. 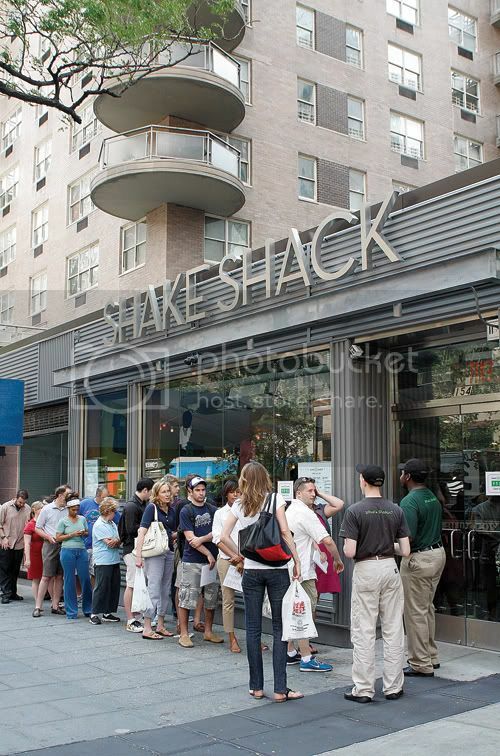 It seems only natural that another branch of Shake Shack should nestle into Upper East Side Manhattan on East 86th between Third and Lexington. If one word could depict this art-nouveau locale, it would be desire. The long, curving line seems as much a fixture as the iconic stainless steel and lime striped interior. Half of the waiting is done outside, peering longingly through finger printed glass, the rest inside, the air sensually flavored with cooking beef. However, for the beef-intolerant, the offerings of chicken hot-dogs and portabella cheeseburgers are also well worth the wait. The L.A. sized burgers come wrapped in waxy sheaths, sporting unnaturally colored condiments: neon green pickles and unnervingly rosy-red tomato slices. There is a separate register line entirely dedicated to a quick hit of frozen delight. The flavors range from the familiar vanilla and chocolate to the experimental green tea, basil and mango. Though without a bar, the Shack offers a wide selection of beers and half-bottles of red and white wine. The metallic table and benches as well as the outdoor seating reflect Shake Shack’s original concept: a modernization of the traditional American picnic. 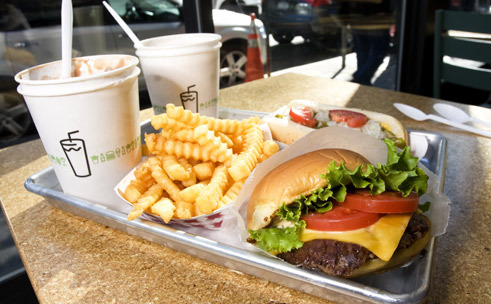 Shake Shack puts a fresh face on fast food and brings an American classic to new zenith of cool.